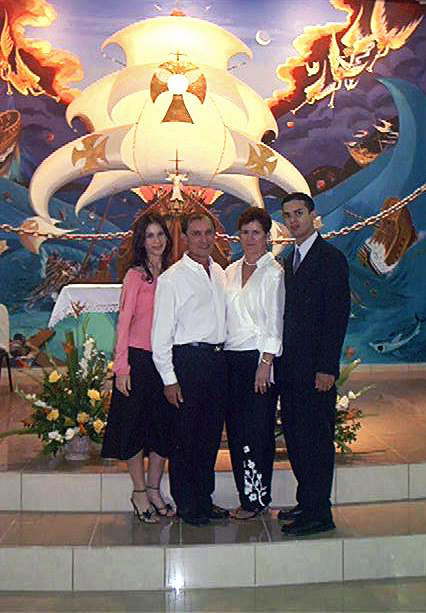 In October of 2003 we were called upon to paint a mural of Sacred Art in the new Catholic Chapel, Capilla San Juan Bosco, in the central mountain town of Orocovis, Puerto Rico. In negotiating the terms of the work I stipulated to Padre Jorge Santiago Cartagena SDB, the Pastor, that besides the agreed upon price of the work I would require Room and Board (“meseta“) for the time that it took to complete the work , so that I could center all of my attention and energy solely on the mural, thus saving my wife Patricia and me the 3-hour daily commute. The first day on the job Padre Jorge introduced us to our host-to-be, Señor Porfirio Martínez, who at the time was instructing a youth class. Señor Martínez, who insisted we call him simply “Fillín”, invited us to go home with him when we finished our work at the end of the day. So that evening we went with him to his home which was located on a mountain top nearby. We met his family, his beautiful and devoted wife Carmín, his lovely teenage daughter Noemí Martínez and his middle son, the studious Samuel. After a tour of the house we were shown to our bedroom that Samuel most generously surrendered to us for the length of our stay, he retiring to a small room under the house. We would live with them for the better part of the next 5 months. We immediately felt as part of the family. Fillín had an aura about him. Although he was in the prime of his life, he possessed the wonderment of a child, the wisdom of an old man, the manners of a diplomat and the warmth and generosity of a saint. We soon became aware however, that these same qualities were shared among the rest of his family including his mother and father-in-law Lola and Cheo, all of his brothers and sister as well as Carmín’s. And indeed his next door neighbors and all of his friends. I came to realize it was an aura that Fillín gave off and it spread around him. In fact the Priests exuded it also. It was like stepping through a curtain and being immersed in a kind of vapor of love and kindness. We finished our work there sometime in late February 2004, returned home and went on to other commissions. It was approximately 6 months later that we received word that Fillín had been diagnosed with brain cancer. 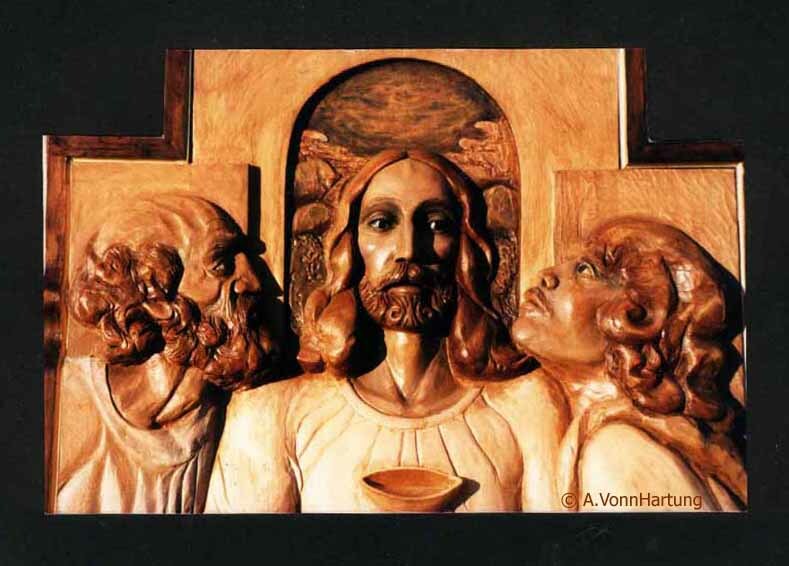 He suffered and died in great dignity surrounded by his family, priests and neighbors. We were told he died the death of a saint surrounded and enveloped by sacred hymns as he drew his last breath. At his wake (“velorio“) held in the same chapel under the mural we had painted, as he lay in state, the most astonishing thing for me (although EVERYONE was weeping) was to see teenagers openly crying with abandon kneeling at his side. He was buried on a high hillside. Scores of us of the many hundreds that accompanied the funeral procession climbed up among the many tombs and gathered around his coffin; it was a beautiful crystal clear day. 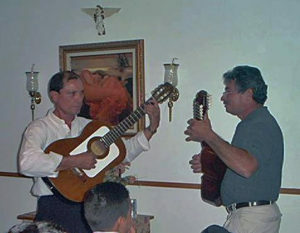 His brothers, musicians all, played their guitars and “cuatros” (Puerto Rican mandolins) as they sang his favorite songs. We all knew we had known a saint and although not officially, I think we all consider him still and sometimes pray with him, Saint Fillín of Orocovis. November 17th is his Feast Day. I posted this testimonial to my Facebook page on 17 November 2013 (the 8th anniversary of Fillín’s passing), and it touched the hearts of so many friends, inspiring 23 comments and 7 shares.